Waited long you have, Padawan. 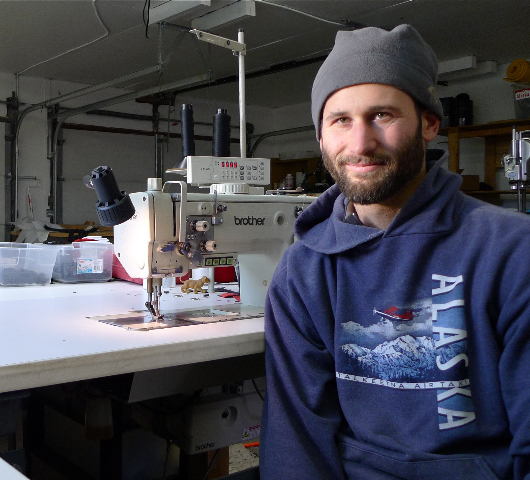 Eric Parsons from Revelate Designs in Alaska shall show you the way to become a lightweight mountain bike Jedi, and tell us how he started his cottage business for innovative bike bags. Read on, and feel the force! Eric, please briefly introduce yourself and tell us who you are. Since when are you backpacking and bike-trekking, and how did you start? How often are you outdoors on a trip nowadays? Let’s see, I’m 34 years old and grew up in New York. My parents introduced me to the mountains early in life so once I had the chance to move west I did, first Colorado then Alaska. I’ve been living in Alaska for about 9 years and loving it. I started mountain biking when I was about 13 and always relished in longer rides. My first real bike tour was in the Indian Himalaya in my early 20’s. That trip was a real eye opener for me and hooked me on bike travel, so now I try to get out on a big international trip every 2 years or so. These days I try to get in a few long trips each summer and the usual weekend jaunts either on foot or bike. In Wrangell St. Elias National Park for a 6 day bike and packrafting traverse. Are you a UL or lightweight backpacker/ bikepacker? If so, what is your typical baseweight? I suppose lightweight, I don’t get too wound up in numbers really. For hiking I also don’t have a standard pack baseweight. Pretty much every trip requires different gear whether it be skis, a packraft, climbing or glacier travel and changes quickly with the seasons in Alaska. So the imaginary gear list is in constant flux. 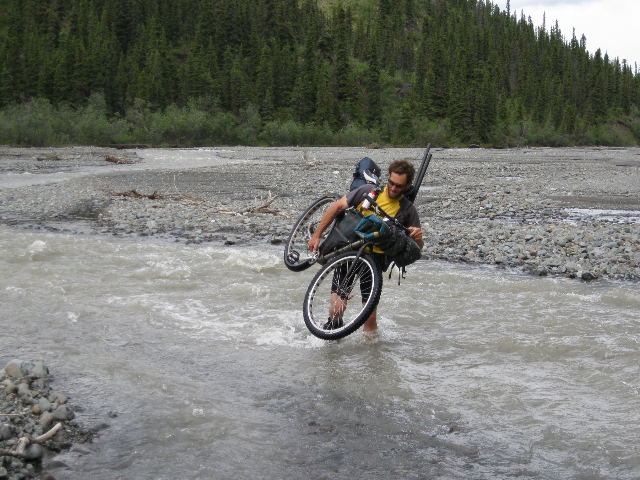 The bike trips we do in Alaska are a bit unconventional and I don’t bother with list or weights really. Please tell us where the name "Revelate Designs" comes from, and what it stands for. The business was originally called “Epic Designs” but I had to change it due to a trademark dispute with a mega bike brand. I brainstormed with the help of friends for months trying to come up with something I liked. One day Nordic skiing the name Revelate came up, derived from the Revelation mountains here in Alaska. It also draws from Revolution – change, and elation – being happy at what you do. So it stuck. But to be honest, nothing really sounds good when you are forced to change the name of a business that you’ve toiled over. Revelate Designs is a cottage business gathering to a very special market - bikepackers and folks who ride their bikes on long trips. Can you tell us how the idea to start the company emerged, if it was easy to quit your previous job and how you see the future of the company? The idea started like many how are doing this sort of thing. Making gear for themselves and really enjoying the process. My former job was working as a Civil Engineer. From the start of a project through design and finally construction could often be 2 years or more. I found that time delay from design to completion very frustrating and unfulfilling. With sewing and small-scale manufacturing, you can build a prototype the same day that you have the idea, so that’s very rewarding. From the practical side, I had been doing long bike tours and saw the benefits of going lighter, using frame bags and dialed in gear. 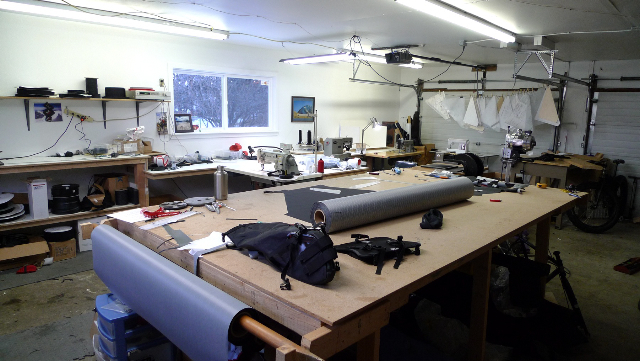 At the time there was no other business that I knew of that offered custom frame bags, or other quality solutions for more unconventional bike travel that did not include racks and panniers. So literally one night I went home and timed myself making a frame bag for a friend to see if it would be realistic having a business doing that… it was, and here I am. 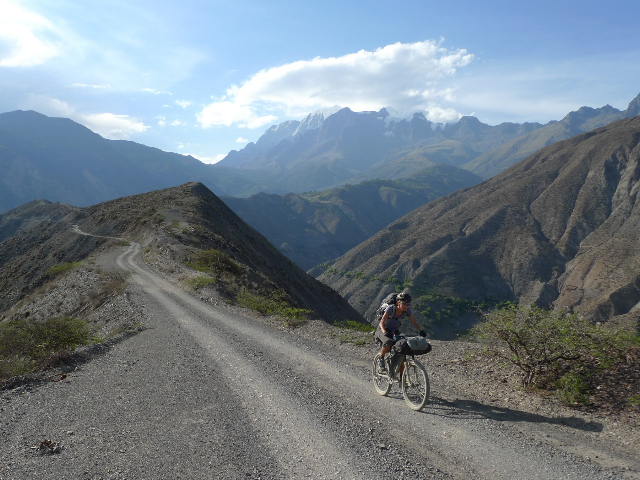 It just so happened that the timing coincided with the literal explosion of bikepacking. You offer some very innovative gear, like The Viscacha and The Harness - can you tell us a bit how you went about the design process of these two pieces, and where the inspiration came from? The Harness concept was derived from using the lid of a backpack as a handle bar bag while holding a stuff sack underneath. 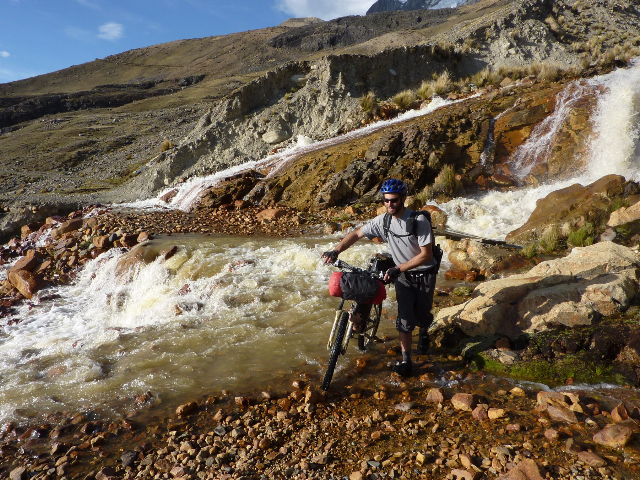 I did a 2-month tour in South America like this along with a ride on the Iditarod trail. Once I learned how to sew, I refined the concept into a rigid mount with a detachable pocket. I love the versatility the system provides and keeps everything waterproof if you use a drybag. The Viscacha came about by request for a smaller version of my original and much larger seat bag made for winter riding. The seat bags were very much customer driven, core riders needed them for the races on the Great Divide Route and other ultra self supported races. For me, these two pieces have consumed the largest chunk of development time by a long shot. Eric, we love to be let in on the work-in-progress stuff! Can you let us know what kind of new products you're working on at the moment? Not so much as far as new products, I’m focused right now on bringing lead times down and increasing production on all the stock items. Ideally I’ll have turnaround time on the custom bags down to a few weeks to make the whole thing more accessible. That said I’m coming out with at least one or two more stock size frame bags and I have long term plans to bring my winter pogies back. How works the R&D at Revelate Designs, do you have a need yourself that you try to fix, or do some of your clients inspire you for new products and ask you for solutions to their problems? All of the above, but simplicity will always trump more bells and whistles. Also, with limited resources I have to make limit what I offer. As demand for my core products have increased, I’ve had to say no to a few people that have had decent product ideas or changes to existing ones. 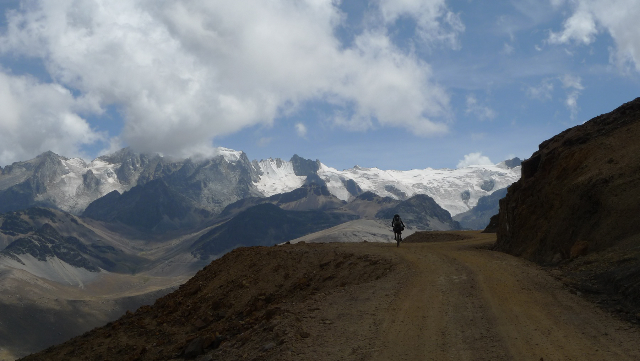 Riding at 15,000' in the Qusima Cruz range, Bolivia. What is the Revelate Designs bestseller, and where do your customer come from? The seat bags for sure, followed by the gas tanks and everything else. Adding a seat bag is a core bikepacking piece so that’s where most people start if they want to ditch using a rear rack. My customers come from all over the USA and I have a decent following in the United Kingdom followed by a few other European countries and Australia. Yes for sure. 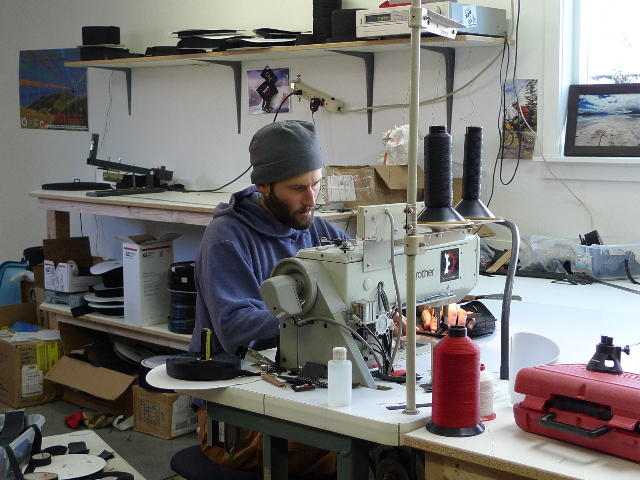 I correspond quite a bit with small companies making outdoor gear. Having mentors has been very important for expanding my knowledge base more than anything. 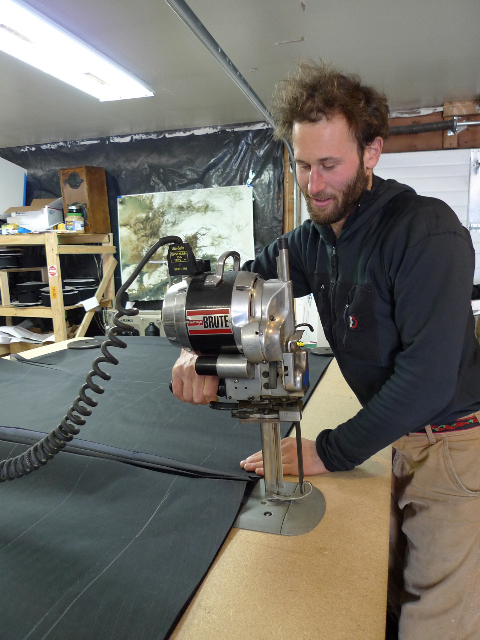 I’m entirely self-taught having never worked in the industury and there is no how to book on outdoor gear manufacturing, so I’m very grateful to those who have given me tidbits of help from sewing to material sourcing. I use all backpacks that I’ve made, but one thing that always comes along is a sil-nylon megamid. The mid, cookie dough and lighters are always with me on a trip. When and where was your last longer backpacking/ bikepacking trip, and what was your baseweight? Are you planning to get out for a trip soon, and enjoy the winter season? Do you think ultralight backpacking and bikepacking will become more popular and break into the mass market, or will it continue to be something for a small group of people? It’s kinda already gone mass market for backpacking, it’s an easy sell for a shop to say “buy this 3 lb tent instead of that 7lb one and your back will feel better. For biking I don’t think it’s as obvious since the bike carries the load for you. The penalties of going heavier are not as apparent until you are really mountain biking on technical trails or doing lots of climbing. For many people “bike touring” by definition includes using racks and panniers. So I think it is more limited than the backpack industury. That said, there is some good crossover in some of the bag usage for commuting and lots of other kinds of cycling. We’ll see. Eric, I thank you for taking the time to answer my questions =) Is there something you would like to add? Thank you for the opportunity, best of luck with the website.